December 2017 Newsletter - Quad City Area Flying Eagles, Inc.
John recently, December 2, passed his currency test under the instruction of Dean Jones. He had joined just this past August. 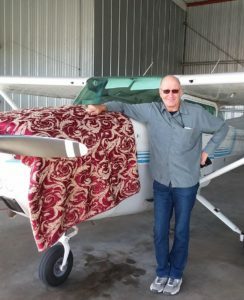 He had not flown for 38 years, so regaining his proficiency with 10 hours of ground school and 15 hours of flying time with Dean is noteworthy. John got into flying on a bet. While sitting in the 49th Aero Squadron restaurant with a friend in Kansas City in 1977, his friend challenged him to learn to fly and bet John $5.00 that he couldn’t learn to fly. John took his friend up on the wager and found an FBO with a flying school at then Palwaukee Airport (now Wheeling Executive Airport), located in the northern suburbs of Chicago. After approximately 70 hours, John had his pilot’s license. He didn’t say if he was able to collect on his wager. Those of you who might run into him at the South Tees will have to ask him. After some time, John moved his flying activity to a small airport (unknown) where a small flying club by the name of Travel Express Agency was located. It was very small with three or four members. He flew a Cessna Skyhawk while there. Dues were $34 per month and operating cost was $30 per hour. Dream of the old days. He stopped flying in 1981 and has not flown until joining the Quad City Area Flying Eagles this past August. John dropped flying in 1981 because of job demands. He moved to the Quad Cities in 1990 to take a job here. He has retired from that job now and works part time for ACT II Transportation. The route that he takes back and forth to work is past the airport. After some time of driving past the airport every day and being reminded of how he enjoyed flying, he decided to act and has now reestablished himself as a pilot again. The character of the new job permits him to fly during the weekdays which he prefers because he feels there is less competition for airplanes at that time over what might exist during the weekend. He is still working to become comfortable with flying out of the Quad Cities Airport, but he will with practice get there just like all of us have. The annual insurance survey is coming up. For the people not familiar with what the survey is about, the club solicits information such as flying time, AOPA status, address changes and so forth. This information is required of us by the insurance company in order to get insurance on our planes. I will distribute the form right after the New Year. Please be prompt at filling in the form and returning it. The insurance bill is due in February, so responding in a reasonable time is essential. Everybody enjoy their Holiday time and be safe.